My family loves olives. 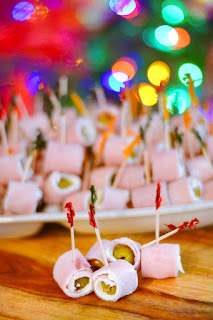 I've already shared one recipe that we make every Christmas and New Years Eve that has olives, Olive Cheese Balls, well this is a second that we have to make as well, Ham Olive Roll up Appetizer. It's so simple and delicious! Let me put it this way, so you know just how delicious these are: I made 175 of these for our Christmas party, and before the party started between Grandma, Grandpa, Mammaw, Pappaw and Ben, half were gone within 20 minutes. I had to put them away so there would be some left! Yes, the Ham Olive Roll Up Appetizers are that good! Ingredients: Olives, Sliced Ham, Cream Cheese. Other tools: strainer with a bowl underneath, paper towel, one butter knife, one sharp knife, and toothpicks. 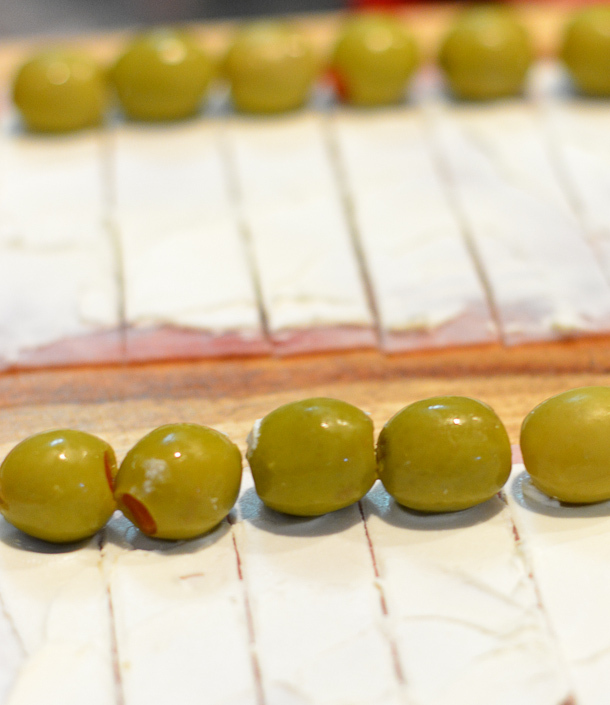 Place the olives in a strainer over a bowl and, use paper towel to blot the front and back of the ham. 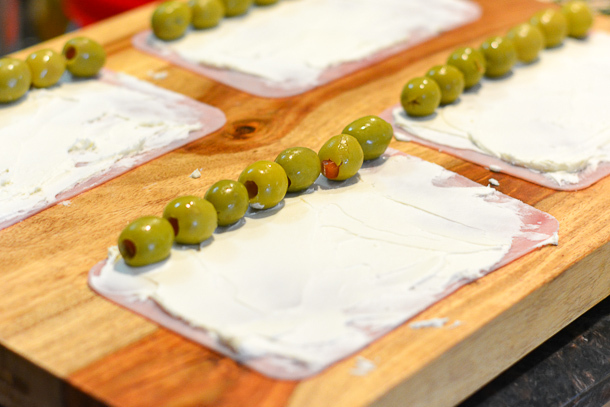 Spread the softened cream cheese, place the olives close together. Then slice and roll! 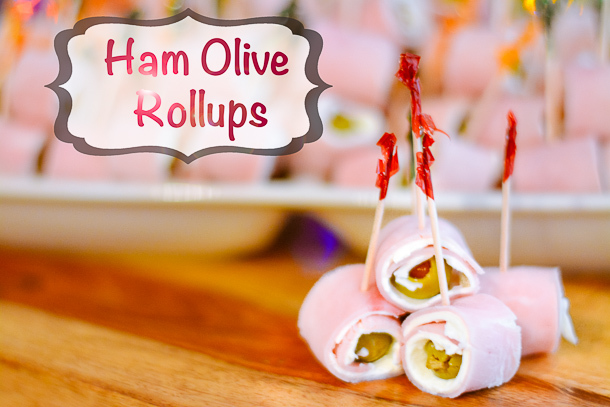 Chill the Ham Olive Roll-ups until ready to serve. Blot both sides of the ham. Smooth the cream cheese onto the ham. 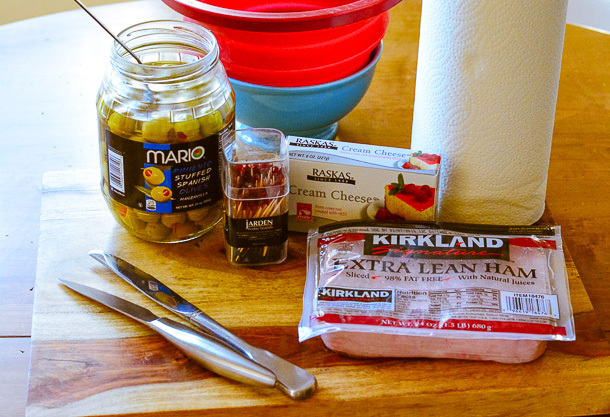 Place the olives across the top of the ham and cream cheese. Slice, rollup and skewer with a toothpick. What is your go-to, crowd pleaser appetizer? Join our conversation on Facebook or Twitter!